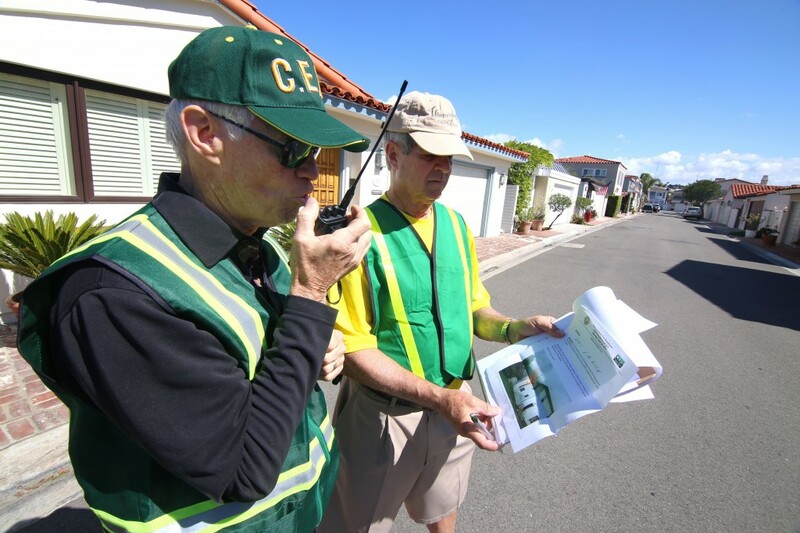 Lido Isle residents Dave Lamb (left) radios in the details of a hypothetical house fire as Hugh Helm checks the incident report during Newport Beach Fire Department’s first ever Community Emergency Response Team multi-neighborhood drill on Saturday. 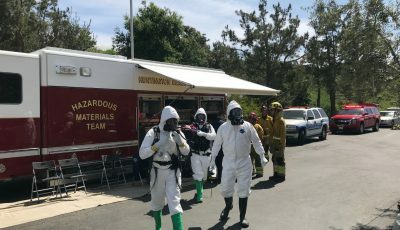 It was all part of the Newport Beach Fire Department’s first ever Community Emergency Response Team multi-neighborhood drill on Saturday. 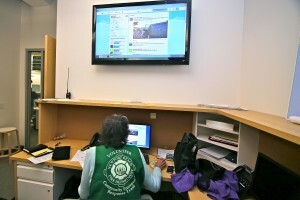 Although the scenario was just a drill, a few hundred CERT volunteers responded like it was real. “We’re really trying to create a culture of preparedness here in Newport,” said NBFD life safety specialist Matt Brisbois, who oversees the CERT program. The drill was meant to test radio and social media communications and volunteer response action in real time. The drill simulated a 7.2 magnitude earthquake at 8:37 a.m. on Saturday along the Newport-Inglewood fault, with the epicenter about one mile inland from Hoag Memorial Hospital Presbyterian. Shaking would be strongly felt throughout the city, Brisbois explained. Telephone, electricity and water service would be interrupted. There would likely be significant damage and injuries. NBFD life safety specialist and CERT program leader, Matt Brisbois (right), talks with volunteers at the city’s Emergency Operations Center during the drill on Saturday. 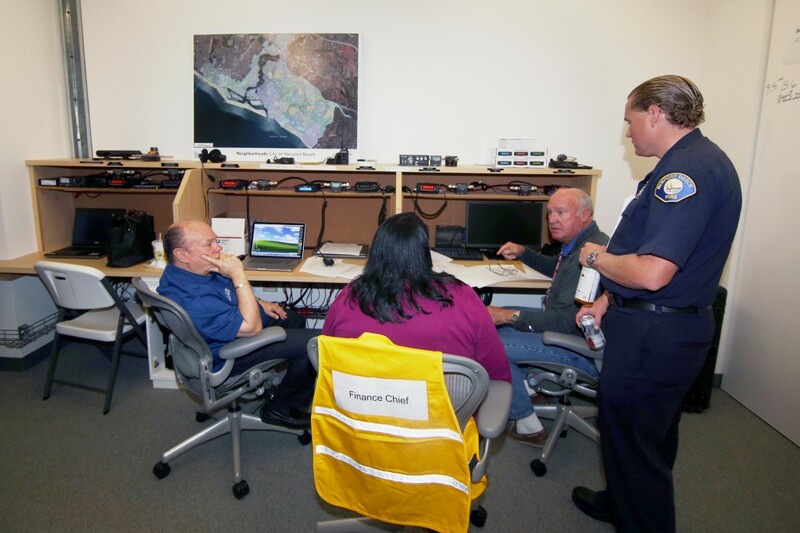 A small group of CERT and Radio Amateur Civil Emergency Service volunteers would quickly join city staff headquartered at the Emergency Operations Center at the civic center. 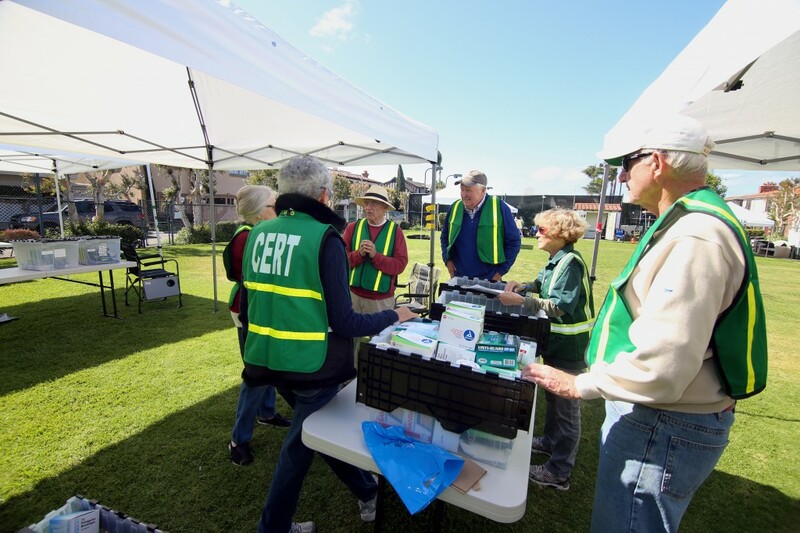 By 9 a.m. on Saturday, CERT and RACES had set up in the specially designated volunteer room at the EOC, just like they would in the event of a real emergency. Also by 9 a.m., neighborhoods across the city were setting up command posts. Lido Isle was among the eight neighborhoods participating on Saturday. About 50 people checked in and helped out at San Remo Park, the Lido command center. “An incredible group has came together today,” said Lido CERT volunteer Bob Chambers. In teams of two, volunteers checked 16 streets in the area for damage, explained Lido resident Mary Anna Jeppe. Since it was just a drill and they couldn’t actually see any damage, volunteers were directed by CERT signs posted throughout their community. There were 40 scenarios that the volunteers came across. There are about 850 homes on Lido. “It’s a little tricky,” Jeppe added. Among the teams were Hugh Helm and Dave Lamb. 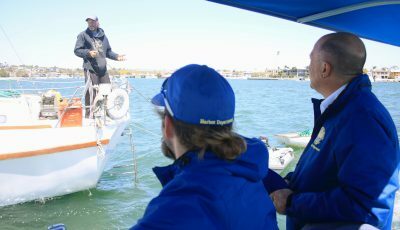 On their second trip out to check the hypothetical damage, they headed over to Via Nice. There, they found a lost child and a house on fire. Helm and Lamb, and other teams reporting incidents, radioed back to the command center communication leaders, who then filtered the information down to the most important details and relayed it to the city EOC. Both agreed that it would be helpful to do the drill more often. 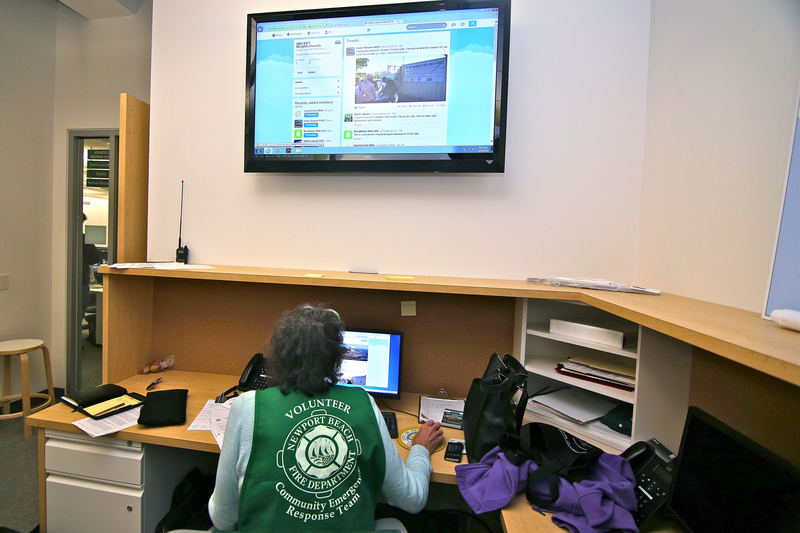 CERT volunteer Karen Tringali checks the Twitter feed for status updates in the volunteer room at the city EOC during Saturday’s drill. Also among the Lido volunteers was a medical team of doctors, nurses and others with medical knowledge. They will be essential during an actual emergency, Jeppe said. During Saturday’s practice, the Lido medical team checked supplies and brain stormed ideas. There was a lot of good input, they all agreed. Even for those trained in the medical field, CERT is a great way to refresh their skills and knowledge, the team agreed. They also learn new skills, like fire suppression and search and rescue. It all helps so they are better prepared for when a disaster happens, they said. The drill helped CERT members figure out any issues they might have in their community, Helm said. Issues like radio dead zones and the need to possibly add another lead communicator at the command center. Volunteers put a lot of work into Saturday’s drill, he continued, and overall it went well. A main concern for Lido would be if the bridge becomes inaccessible, Chambers noted. As the only land-based route on and off the island, if the bridge falls residents need to be ready to care for themselves and figure out a water-based method to evacuate, if necessary. “We would be on our own,” Chambers said. It’s important for residents to be prepared because police and fire crews are likely not going to be available for some time following a disaster, Jeppe said. In a real emergency, local volunteer response will depend on how many people are trained and available, Lamb said. The more people get involved with CERT and the Lido team, the better, he added. That goes for the entire city, he continued. 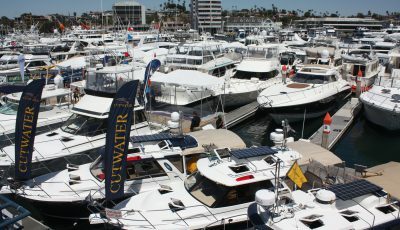 Only eight neighborhoods out of 154 in Newport Beach participated Saturday. While that number is great, it could be better. 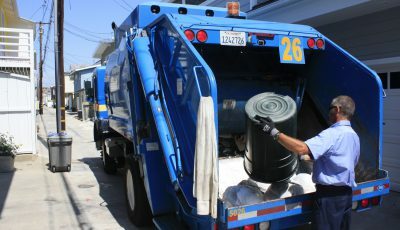 For more information on the CERT program, visit nbcert.org or contact Matt Brisbois at [email protected] or call (949) 644-3112. The next CERT class starts in September. The Lido Isle CERT medical team discuss ideas during the drill.